West Harrison, NY, April 09, 2019 --(PR.com)-- At the 35th annual American Academy of Cosmetic Dentistry (AACD) Scientific Session in San Diego, California, Westchester cosmetic dentist Robert Rioseco, DDS will become an Accredited Member of the AACD along with seven of his esteemed colleagues. AACD Accreditation is thus far the capstone achievement of Dr. Rioseco’s decades-long career at The Center for Cosmetic Dentistry. "The AACD Accreditation process has been a long, but worthwhile journey. From the written exams to the submission of five case types, every step has been both a learning and humbling experience. This process has forced me to step back and really take a close look at all the work I do, and to raise it to the five star standards of accreditation. It has allowed me to collaborate and take direction and criticism from some of the best minds in dentistry." Ultimately, Dr. Rioseco is, "very grateful to the academy and the committee for its support throughout the process." 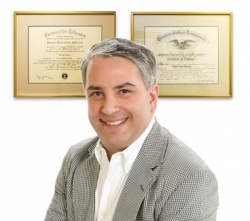 He looks forward to the AACD Accreditation ceremony and plans to continue to spending his career helping patients and furthering his journey within the field of cosmetic dentistry. For more information about Dr. Rioseco and his practice, please visit zendentist.com and facebook.com/TheCenterForCosmeticDentistry/.